Travel the Chilcotin Highway 20 west from Williams Lake, British Columbia, to Bella Coola on the Central Coast and experience a view of modern ranching and logging as well as a step back into the early days of the Chilcotin Country. The Chilcotin is a magnificent land offering vacationers a variety of activities; from river rafting and fishing to camping and wildlife viewing. Or, experience a complete western adventure at a guest ranch or lodge. One of British Columbia's last frontiers, the Chilcotin and BC's Central Coast has something for everyone. Memories in the making. About 23 km (14 mi.) 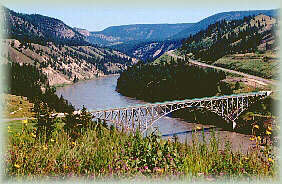 west of Williams Lake you will cross the Mighty Fraser River on the Sheep Creek Bridge. The steep Sheep Creek Hill climbing up from the bridge can afford you a spectacular view of the entire area. 13km. (8mi.) from the bridge you will come across a strange site of towers and flashing lights on the north side of the highway. This is the Loran Tower which is a maritime navigational tower. It is open to the public at certain times or tours can be arranged. This first small community you arrive at, Riske Creek is situated about 52 km (32 mi.) west of Williams Lake, and is the gateway to a vast number of adventures in the Chilcotin. Although the earliest activity in the area was trading, the 1860's saw cattle ranchers arrive. 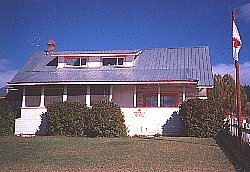 The village of Riske Creek is the site of one of the earliest ranches in the area owned by a Polish gentleman, L.W. Riskie. 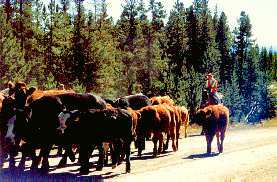 Ranching and logging remain as the main industries of the area. With the amenities such as gas, lodgings and general store available this is the ideal spot to begin a Chilcotin adventure. The history of the area can be relived in the summer Riske Creek Rodeo and Frontier Days, while modern day sites and adventures can begin at this spot. A number of day trips originate in Riske Creek; turn off Highway 20 just east of Riske Creek. You will have a good chance of spotting Big Horn Sheep at nearby Junction Sheep Reserve (15 km (9 mi. ), another 5 km (3 mi.) will bring you to the spectacular Farwell Canyon. At Farwell Canyon, near the junction of the Chilcotin and Fraser Rivers, you will be awed by the magnificence of the freestanding sandstone formations, the hoo-doos; be touched by the history brought to life by the Indian pictographs on nearby cliffs; feel the excitement of river rafters buffeting their way down the river rapids; experience the thrill of watching the native fishermen dipnetting for salmon. From Farwell Canyon you can wind your way on good gravel to the tiny community of Big Creek and then onto some fishing, camping or boating at the BC Forest Service Campsite on Fletcher Lake. From Fletcher Lake the road takes you to Highway 20 and historic Hanceville which is located on the site of an early ranch belonging to Tom Hance. While accessing all the modern amenities of restaurant, store, laundramat and post office, you can admire the distant view of spectacular snowcapped mountains. The small town of Hanceville, BC, is known for the infamous Lee's Corner, where Norman Lee, a cattle rancher attempting to push his herd almost 2500 km (1550 miles) through the wilds, met fate. During the journey his horses died, leaving him to carry on by foot. As winter closed in Norman Lee had to butcher his herd. Fortunately, he survived the ordeal and his book, "Klondike Cattle Drive" outlines, in detail, the event. The area surrounding Hanceville provides spectacular view and landscapes. Plunging canyons, rivers and sandstone and lava formations are just some of the natural attractions this area has to offer. Location: Hanceville is located 42 km (26.04 miles) west of Riske Creek on the Freedom Highway 20. Travelling west from Hanceville on Highway 20 brings you to the community of Alexis Creek, named after Chief Alexis, chief of the Chilcotin Indians. 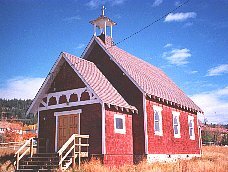 This settlement services the area with the RCMP station, a Red Cross Station, church, British Columbia Forest Service office and school as well as post office, store and gas station. There are a number of nearby lakes suitable for fishing, boating and swimming with skiing and skidooing in the winter. 10 km. (6 mi.) 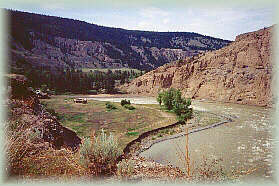 west of Alexis Creek is the Bull Canyon Provincial Park. Situated along the Chilcotin river, the site is an historic battleground as well as the locale of many historical arfifacts and lodgings; an area filled with history and stunning scenery. The community of Tatla Lake is located 122 km (76 miles) west of Alexis Creek on Highway 20 and offers accommodation, food and other necessary supplies. Situated on the edge of the Chilcotin Plateau, this area provides access to wilderness fly-in lakes and rivers, nordic ski trails and excellent mountain hikes.Plantlife is varied and ranges from old-growth Douglas fir, western hemlock, red cedar, heathers and dry grass species. There are several resorts and guiding operations in the area. Nimpo Lake, also known as the float plane capital of B.C., is a popular destination for families and fishers alike. 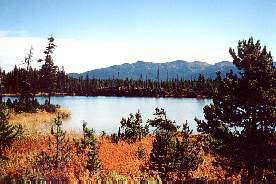 Nimpo Lake is a scenic 12 km (7 mi.) long lake, with Mt. Kappan in the background, has many resorts and offers a variety of summer and winter activities. Some of the best rainbow fishing as well as boating, swimming, hiking and hunting are just some of the attractions for visitors to the Nimpo Lake area. 5 km (3 mi.) from Nimpo Lake is a BC Forest Service Recreation Site which is popular for canoeing and nature viewing. The Lessard Lake Road, approximately 18 km (11 mi.) 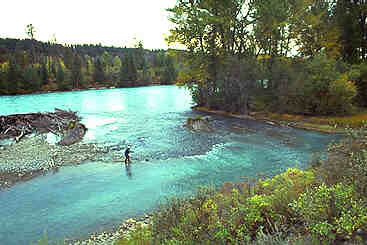 west of Nimpo Lake will take you along the Dean River, famous worldwide for its Steelhead. The majestic, multi-coloured Rainbow Range, from which obsidian (volcanic glass) is obtained, is also visible. The early Chilcotins used to trade in this commodity which could make extremely sharp tools. Anahim Lake was named after a Chilcotin chief. There have been mentions of a "Lake Anawhim" by travellers in the mid 1800s. Home of the "Old Fashioned Wild West Rodeo" each July, Anahim Lake and area offer interesting sights and activities for the visitor. It is also the last community before entering Tweedsmuir Provincial Park; an outdoor person's "heaven". Closer to the community there are a number of lodges and resorts that cater to the fisher, hunter, hikers or those who want organized pack trips or mountain rides. Float planes will take you to a myriad of nearby wilderness experiences. Nearby Anahim Mountain offers a bit of history plus a spectacular view of a pillared cone of volcanic rock; this is another site for obsidian, the important trading commodity for the Chilcotins as it was used extensively for weapon making. A Forest Service Recreation site on Little Anahim Lake offers an idyllic spot for canoeing, picnicing and waterfowl observation.